It’s well a single malt whisky, not a blended malt. It must have been rather tricky to replicate an old single malt using another single malt instead of a vatting of various origins. Colour: straw. Nose: it does have something clearly ‘ancient’, with more soot than in modern whiskies, more mineral grasses, and some green nuttiness, as in fresh walnut skins. Perhaps wee touches of goji berries and crushed mints. Mouth: really unusual, starting with some green pepper, some cardamom, and a bitter leather, then we have rather some cured ham and quite a lot of caraway. A sweet and sour style that’s not often to be encountered. Finish: medium, grassy, with bitter fruits. A little soy sauce as well, more cumin, ginger… Comments: good but this is not a style that I usually cherish. It reminds of that ‘sherry’ that you may taste from the casks at he bodegas that specialise in making bespoke seasoned ‘sherry casks’ for the whisky industry. There are chances that this is a genuine old Stronachie, but as they say, you never know for sure when bottles are this rare and when it’s hard to do any proper comparisons. 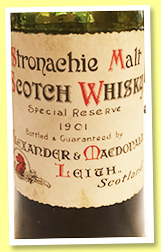 What’s sure is that it had the original Stronachie foil over the driven cork, and it seems that that cork was ‘coherent’. 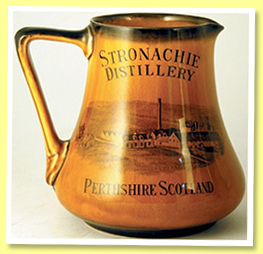 As for Stronachie Distillery, it was located near Perth and had only been active for around 30 to 40 years. It was mothballed in 1928. Colour: gold, slightly cloudy. Nose: it’s richer and rounder than the current 10, more complex as well. There’s some faint rubber, some soot, a feeling of old honey jar, old mead, honeysuckle, then rather more medicinal notes, old ointments, tiger balm, then rather gravel and clay, rancio… It does nose ‘old’ and does have wee hints of stoneware (clay), but it hasn’t got much OBE as such, although that’s no proof of either outcome. Could be an old bottle indeed.